This article is about linear momentum. It is not to be confused with angular momentum. This article is about momentum in physics. For other uses, see Momentum (disambiguation). Momentum of a pool cue ball is transferred to the racked balls after collision. In SI units, it is measured in kilogram meters per second (kg⋅m/s). Newton's second law of motion states that a body's rate of change in momentum is equal to the net force acting on it. Momentum depends on the frame of reference, but in any inertial frame it is a conserved quantity, meaning that if a closed system is not affected by external forces, its total linear momentum does not change. Momentum is also conserved in special relativity (with a modified formula) and, in a modified form, in electrodynamics, quantum mechanics, quantum field theory, and general relativity. It is an expression of one of the fundamental symmetries of space and time: translational symmetry. Advanced formulations of classical mechanics, Lagrangian and Hamiltonian mechanics, allow one to choose coordinate systems that incorporate symmetries and constraints. In these systems the conserved quantity is generalized momentum, and in general this is different from the kinetic momentum defined above. The concept of generalized momentum is carried over into quantum mechanics, where it becomes an operator on a wave function. The momentum and position operators are related by the Heisenberg uncertainty principle. 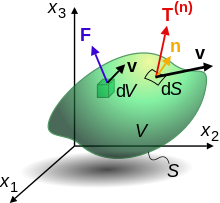 In continuous systems such as electromagnetic fields, fluids and deformable bodies, a momentum density can be defined, and a continuum version of the conservation of momentum leads to equations such as the Navier–Stokes equations for fluids or the Cauchy momentum equation for deformable solids or fluids. Momentum is a vector quantity: it has both magnitude and direction. Since momentum has a direction, it can be used to predict the resulting direction and speed of motion of objects after they collide. Below, the basic properties of momentum are described in one dimension. The vector equations are almost identical to the scalar equations (see multiple dimensions). The unit of momentum is the product of the units of mass and velocity. In SI units, if the mass is in kilograms and the velocity is in meters per second then the momentum is in kilogram meters per second (kg⋅m/s). In cgs units, if the mass is in grams and the velocity in centimeters per second, then the momentum is in gram centimeters per second (g⋅cm/s). Being a vector, momentum has magnitude and direction. For example, a 1 kg model airplane, traveling due north at 1 m/s in straight and level flight, has a momentum of 1 kg⋅m/s due north measured with reference to the ground. This is known as Euler's first law. hence the net force is equal to the mass of the particle times its acceleration. Example: A model airplane of mass 1 kg accelerates from rest to a velocity of 6 m/s due north in 2 s. The net force required to produce this acceleration is 3 newtons due north. The change in momentum is 6 kg⋅m/s. The rate of change of momentum is 3 (kg⋅m/s)/s = 3 N.
This law holds no matter how complicated the force is between particles. Similarly, if there are several particles, the momentum exchanged between each pair of particles adds up to zero, so the total change in momentum is zero. This conservation law applies to all interactions, including collisions and separations caused by explosive forces. It can also be generalized to situations where Newton's laws do not hold, for example in the theory of relativity and in electrodynamics. Newton's apple in Einstein's elevator. In person A's frame of reference, the apple has non-zero velocity and momentum. In the elevator's and person B's frames of reference, it has zero velocity and momentum. Momentum is a measurable quantity, and the measurement depends on the motion of the observer. For example: if an apple is sitting in a glass elevator that is descending, an outside observer, looking into the elevator, sees the apple moving, so, to that observer, the apple has a non-zero momentum. To someone inside the elevator, the apple does not move, so, it has zero momentum. The two observers each have a frame of reference, in which, they observe motions, and, if the elevator is descending steadily, they will see behavior that is consistent with those same physical laws. Thus, momentum is conserved in both reference frames. Moreover, as long as the force has the same form, in both frames, Newton's second law is unchanged. Forces such as Newtonian gravity, which depend only on the scalar distance between objects, satisfy this criterion. This independence of reference frame is called Newtonian relativity or Galilean invariance. A change of reference frame, can, often, simplify calculations of motion. For example, in a collision of two particles, a reference frame can be chosen, where, one particle begins at rest. Another, commonly used reference frame, is the center of mass frame – one that is moving with the center of mass. In this frame, the total momentum is zero. By itself, the law of conservation of momentum is not enough to determine the motion of particles after a collision. Another property of the motion, kinetic energy, must be known. This is not necessarily conserved. If it is conserved, the collision is called an elastic collision; if not, it is an inelastic collision. An elastic collision is one in which no kinetic energy is absorbed in the collision. Perfectly elastic "collisions" can occur when the objects do not touch each other, as for example in atomic or nuclear scattering where electric repulsion keeps them apart. A slingshot maneuver of a satellite around a planet can also be viewed as a perfectly elastic collision. A collision between two pool balls is a good example of an almost totally elastic collision, due to their high rigidity, but when bodies come in contact there is always some dissipation. If one body has much greater mass than the other, its velocity will be little affected by a collision while the other body will experience a large change. In an inelastic collision, some of the kinetic energy of the colliding bodies is converted into other forms of energy (such as heat or sound). Examples include traffic collisions, in which the effect of loss of kinetic energy can be seen in the damage to the vehicles; electrons losing some of their energy to atoms (as in the Franck–Hertz experiment); and particle accelerators in which the kinetic energy is converted into mass in the form of new particles. In a frame of reference moving at the speed v), the objects are brought to rest by the collision and 100% of the kinetic energy is converted to other forms of energy. The momentum and energy equations also apply to the motions of objects that begin together and then move apart. For example, an explosion is the result of a chain reaction that transforms potential energy stored in chemical, mechanical, or nuclear form into kinetic energy, acoustic energy, and electromagnetic radiation. Rockets also make use of conservation of momentum: propellant is thrust outward, gaining momentum, and an equal and opposite momentum is imparted to the rocket. Two-dimensional elastic collision. There is no motion perpendicular to the image, so only two components are needed to represent the velocities and momenta. The two blue vectors represent velocities after the collision and add vectorially to get the initial (red) velocity. Each vector equation represents three scalar equations. Often coordinates can be chosen so that only two components are needed, as in the figure. Each component can be obtained separately and the results combined to produce a vector result. A simple construction involving the center of mass frame can be used to show that if a stationary elastic sphere is struck by a moving sphere, the two will head off at right angles after the collision (as in the figure). where u is the velocity of the ejected/accreted mass as seen in the object's rest frame. This is distinct from v, which is the velocity of the object itself as seen in an inertial frame. This equation is derived by keeping track of both the momentum of the object as well as the momentum of the ejected/accreted mass (dm). When considered together, the object and the mass (dm) constitute a closed system in which total momentum is conserved. Newtonian physics assumes that absolute time and space exist outside of any observer; this gives rise to Galilean invariance. It also results in a prediction that the speed of light can vary from one reference frame to another. This is contrary to observation. In the special theory of relativity, Einstein keeps the postulate that the equations of motion do not depend on the reference frame, but assumes that the speed of light c is invariant. As a result, position and time in two reference frames are related by the Lorentz transformation instead of the Galilean transformation. m0 is the object's invariant mass. Within the domain of classical mechanics, relativistic momentum closely approximates Newtonian momentum: at low velocity, γm0v is approximately equal to m0v, the Newtonian expression for momentum. Thus, conservation of four-momentum is Lorentz-invariant and implies conservation of both mass and energy. and is invariant across all reference frames. In a game of relativistic "billiards", if a stationary particle is hit by a moving particle in an elastic collision, the paths formed by the two afterwards will form an acute angle. This is unlike the non-relativistic case where they travel at right angles. For a particle, the relationship between temporal components, E = ħ ω, is the Planck–Einstein relation, and the relation between spatial components, p= ħ k, describes a de Broglie matter wave. Newton's laws can be difficult to apply to many kinds of motion because the motion is limited by constraints. For example, a bead on an abacus is constrained to move along its wire and a pendulum bob is constrained to swing at a fixed distance from the pivot. Many such constraints can be incorporated by changing the normal Cartesian coordinates to a set of generalized coordinates that may be fewer in number. Refined mathematical methods have been developed for solving mechanics problems in generalized coordinates. They introduce a generalized momentum, also known as the canonical or conjugate momentum, that extends the concepts of both linear momentum and angular momentum. To distinguish it from generalized momentum, the product of mass and velocity is also referred to as mechanical, kinetic or kinematic momentum. The two main methods are described below. If a coordinate qi is not a Cartesian coordinate, the associated generalized momentum component pi does not necessarily have the dimensions of linear momentum. Even if qi is a Cartesian coordinate, pi will not be the same as the mechanical momentum if the potential depends on velocity. Some sources represent the kinematic momentum by the symbol Π. Each component pj is said to be the conjugate momentum for the coordinate qj. This is the generalization of the conservation of momentum. Even if the generalized coordinates are just the ordinary spatial coordinates, the conjugate momenta are not necessarily the ordinary momentum coordinates. An example is found in the section on electromagnetism. As in Lagrangian mechanics, if a generalized coordinate does not appear in the Hamiltonian, its conjugate momentum component is conserved. Conservation of momentum is a mathematical consequence of the homogeneity (shift symmetry) of space (position in space is the canonical conjugate quantity to momentum). That is, conservation of momentum is a consequence of the fact that the laws of physics do not depend on position; this is a special case of Noether's theorem. In Newtonian mechanics, the law of conservation of momentum can be derived from the law of action and reaction, which states that every force has a reciprocating equal and opposite force. Under some circumstances, moving charged particles can exert forces on each other in non-opposite directions. Nevertheless, the combined momentum of the particles and the electromagnetic field is conserved. The Lorentz force imparts a momentum to the particle, so by Newton's second law the particle must impart a momentum to the electromagnetic fields. The electromagnetic stress tensor depends on the properties of the media. In quantum mechanics, momentum is defined as a self-adjoint operator on the wave function. The Heisenberg uncertainty principle defines limits on how accurately the momentum and position of a single observable system can be known at once. In quantum mechanics, position and momentum are conjugate variables. where the operator p acting on a wave function ψ(p) yields that wave function multiplied by the value p, in an analogous fashion to the way that the position operator acting on a wave function ψ(x) yields that wave function multiplied by the value x.
Electromagnetic radiation (including visible light, ultraviolet light, and radio waves) is carried by photons. Even though photons (the particle aspect of light) have no mass, they still carry momentum. This leads to applications such as the solar sail. The calculation of the momentum of light within dielectric media is somewhat controversial (see Abraham–Minkowski controversy). In fields such as fluid dynamics and solid mechanics, it is not feasible to follow the motion of individual atoms or molecules. Instead, the materials must be approximated by a continuum in which there is a particle or fluid parcel at each point that is assigned the average of the properties of atoms in a small region nearby. In particular, it has a density ρ and velocity v that depend on time t and position r. The momentum per unit volume is ρv. Applied to any physical quantity, the material derivative includes the rate of change at a point and the changes due to advection as fluid is carried past the point. Per unit volume, the rate of change in momentum is equal to ρDv/Dt. This is equal to the net force on the droplet. where μ is the viscosity. This is also a flux, or flow per unit area, of x-momentum through the surface. These are known as the Navier–Stokes equations. where f is the body force. The Cauchy momentum equation is broadly applicable to deformations of solids and liquids. The relationship between the stresses and the strain rate depends on the properties of the material (see Types of viscosity). where c is the speed of sound. In a solid, similar equations can be obtained for propagation of pressure (P-waves) and shear (S-waves). The flux, or transport per unit area, of a momentum component ρvj by a velocity vi is equal to ρ vjvj. In the linear approximation that leads to the above acoustic equation, the time average of this flux is zero. However, nonlinear effects can give rise to a nonzero average. It is possible for momentum flux to occur even though the wave itself does not have a mean momentum. In about 530 AD, working in Alexandria, Byzantine philosopher John Philoponus developed a concept of momentum in his commentary to Aristotle's Physics. Aristotle claimed that everything that is moving must be kept moving by something. For example, a thrown ball must be kept moving by motions of the air. Most writers continued to accept Aristotle's theory until the time of Galileo, but a few were skeptical. Philoponus pointed out the absurdity in Aristotle's claim that motion of an object is promoted by the same air that is resisting its passage. He proposed instead that an impetus was imparted to the object in the act of throwing it. Ibn Sīnā (also known by his Latinized name Avicenna) read Philoponus and published his own theory of motion in The Book of Healing in 1020. He agreed that an impetus is imparted to a projectile by the thrower; but unlike Philoponus, who believed that it was a temporary virtue that would decline even in a vacuum, he viewed it as a persistent, requiring external forces such as air resistance to dissipate it. The work of Philoponus, and possibly that of Ibn Sīnā, was read and refined by the European philosophers Peter Olivi and Jean Buridan. Buridan, who in about 1350 was made rector of the University of Paris, referred to impetus being proportional to the weight times the speed. Moreover, Buridan's theory was different from his predecessor's in that he did not consider impetus to be self-dissipating, asserting that a body would be arrested by the forces of air resistance and gravity which might be opposing its impetus. René Descartes believed that the total "quantity of motion" (Latin: quantitas motus) in the universe is conserved, where the quantity of motion is understood as the product of size and speed. This should not be read as a statement of the modern law of momentum, since he had no concept of mass as distinct from weight and size, and more importantly he believed that it is speed rather than velocity that is conserved. So for Descartes if a moving object were to bounce off a surface, changing its direction but not its speed, there would be no change in its quantity of motion. Galileo, in his Two New Sciences, used the Italian word impeto to similarly describe Descartes' quantity of motion. Leibniz, in his "Discourse on Metaphysics", gave an argument against Descartes' construction of the conservation of the "quantity of motion" using an example of dropping blocks of different sizes different distances. He points out that force is conserved but quantity of motion, construed as the product of size and speed of an object, is not conserved. The first correct statement of the law of conservation of momentum was by English mathematician John Wallis in his 1670 work, Mechanica sive De Motu, Tractatus Geometricus: "the initial state of the body, either of rest or of motion, will persist" and "If the force is greater than the resistance, motion will result". Wallis uses momentum and vis for force. Newton's Philosophiæ Naturalis Principia Mathematica, when it was first published in 1687, showed a similar casting around for words to use for the mathematical momentum. His Definition II defines quantitas motus, "quantity of motion", as "arising from the velocity and quantity of matter conjointly", which identifies it as momentum. Thus when in Law II he refers to mutatio motus, "change of motion", being proportional to the force impressed, he is generally taken to mean momentum and not motion. It remained only to assign a standard term to the quantity of motion. The first use of "momentum" in its proper mathematical sense is not clear but by the time of Jenning's Miscellanea in 1721, five years before the final edition of Newton's Principia Mathematica, momentum M or "quantity of motion" was being defined for students as "a rectangle", the product of Q and V, where Q is "quantity of material" and V is "velocity", s/t. ^ Euler's Laws of Motion. Archived from the original on 2009-07-10. Retrieved 2009-03-30. ^ McGill and King (1995). Engineering Mechanics, An Introduction to Dynamics (3rd ed.). PWS Publishing Company. ISBN 978-0-534-93399-9. ^ Ho-Kim, Quang; Kumar, Narendra; Lam, Harry C.S. (2004). Invitation to Contemporary Physics (illustrated ed.). World Scientific. p. 19. ISBN 978-981-238-303-7. ^ Carl Nave (2010). "Elastic and inelastic collisions". Hyperphysics. Archived from the original on 18 August 2012. Retrieved 2 August 2012. ^ Serway, Raymond A.; John W. Jewett, Jr (2012). Principles of physics : a calculus-based text (5th ed.). Boston, MA: Brooks/Cole, Cengage Learning. p. 245. ISBN 9781133104261. ^ Carl Nave (2010). "Forces in car crashes". Hyperphysics. Archived from the original on 22 August 2012. Retrieved 2 August 2012. ^ Carl Nave (2010). "The Franck-Hertz Experiment". Hyperphysics. Archived from the original on 16 July 2012. Retrieved 2 August 2012. ^ McGinnis, Peter M. (2005). Biomechanics of sport and exercise (2nd ed.). Champaign, IL [u.a. ]: Human Kinetics. p. 85. ISBN 9780736051019. Archived from the original on 2016-08-19. ^ a b Kleppner; Kolenkow. An Introduction to Mechanics. pp. 135–39. ^ Misner, Charles W.; Kip S. Thorne; John Archibald Wheeler (1973). Gravitation. 24th printing. New York: W.H. Freeman. p. 51. ISBN 9780716703440. ^ Rindler, Wolfgang (1991). Introduction to Special Relativity (2nd ed.). Oxford Science Publications. pp. 82–84. ISBN 978-0-19-853952-0. ^ a b Lerner, Rita G.; Trigg, George L., eds. (2005). Encyclopedia of physics (3rd ed.). Weinheim: Wiley-VCH-Verl. ISBN 978-3527405541. ^ Hand, Louis N.; Finch, Janet D. (1998). Analytical mechanics (7th print ed.). Cambridge: Cambridge University Press. Chapter 4. ISBN 9780521575720. ^ Griffiths, David J. (2013). Introduction to electrodynamics (Fourth ed.). Boston: Pearson. p. 361. ISBN 978-0321856562. ^ a b c d Jackson 1975, pp. 238–241 Expressions, given in Gaussian units in the text, were converted to SI units using Table 3 in the Appendix. ^ Z.Y.Wang (2016). "Generalized momentum equation of quantum mechanics". Optical and Quantum Electronics. 48 (2): 1–9. doi:10.1007/s11082-015-0261-8. ^ Barnett, Stephen M. (2010). "Resolution of the Abraham-Minkowski Dilemma" (PDF). Physical Review Letters. 104 (7): 070401. Bibcode:2010PhRvL.104g0401B. doi:10.1103/PhysRevLett.104.070401. PMID 20366861. ^ Wang Zhong-Yue; Wang Pin-Yu; Xu Yan-Rong (2011). "Crucial experiment to resolve Abraham-Minkowski Controversy". Optik. 122 (22): 1994–1996. arXiv:1103.3559. Bibcode:2011Optik.122.1994W. doi:10.1016/j.ijleo.2010.12.018. ^ Bird, R. Byron; Warren Stewart; Edwin N. Lightfoot (2007). Transport phenomena (2nd ed.). New York: Wiley. p. 13. ISBN 9780470115398. ^ Acheson, D.J. (1990). Elementary Fluid Dynamics. Oxford University Press. p. 205. ISBN 978-0-19-859679-0. ^ Gubbins, David (1992). Seismology and plate tectonics (Repr. (with corr.) ed.). Cambridge [England]: Cambridge University Press. p. 59. ISBN 978-0521379953. ^ LeBlond, Paul H.; Mysak, Lawrence A. (1980). Waves in the ocean (2. impr. ed.). Amsterdam [u.a. ]: Elsevier. p. 258. ISBN 9780444419262. ^ McIntyre, M.E. (1981). "On the 'wave momentum' myth". J. Fluid Mech. 106: 331–347. Bibcode:1981JFM...106..331M. doi:10.1017/s0022112081001626. ^ "John Philoponus". Stanford Encyclopedia of Philosophy. 8 June 2007. Retrieved 26 July 2012. ^ Espinoza, Fernando (2005). "An analysis of the historical development of ideas about motion and its implications for teaching". Physics Education. 40 (2): 141. Bibcode:2005PhyEd..40..139E. doi:10.1088/0031-9120/40/2/002. ^ Seyyed Hossein Nasr & Mehdi Amin Razavi (1996). The Islamic intellectual tradition in Persia. Routledge. p. 72. ISBN 978-0-7007-0314-2. ^ a b Aydin Sayili (1987). "Ibn Sīnā and Buridan on the Motion of the Projectile". Annals of the New York Academy of Sciences. 500 (1): 477–482. Bibcode:1987NYASA.500..477S. doi:10.1111/j.1749-6632.1987.tb37219.x. ^ T.F. Glick; S.J. Livesay; F. Wallis. "Buridian, John". Medieval Science, Technology and Medicine:an Encyclopedia. p. 107. ^ Park, David (1990). The how and the why : an essay on the origins and development of physical theory. With drawings by Robin Brickman (3rd print ed.). Princeton, NJ: Princeton University Press. pp. 139–141. ISBN 9780691025087. ^ Alexander Afriat, "Cartesian and Lagrangian Momentum" Archived 2017-03-09 at the Wayback Machine (2004). ^ Daniel Garber (1992). "Descartes' Physics". In John Cottingham (ed.). The Cambridge Companion to Descartes. Cambridge: Cambridge University Press. pp. 310–319. ISBN 978-0-521-36696-0. ^ Rothman, Milton A. (1989). Discovering the natural laws : the experimental basis of physics (2nd ed.). New York: Dover Publications. pp. 83–88. ISBN 9780486261782. ^ G.W. Leibniz (1989). "Discourse on Metaphysics". In Roger Ariew; Daniel Garber (eds.). Philosophical Essays. Indianapolis, IN: Hackett Publishing Company, Inc. pp. 49–51. ISBN 978-0-87220-062-3. ^ Scott, J.F. (1981). The Mathematical Work of John Wallis, D.D., F.R.S. Chelsea Publishing Company. p. 111. ISBN 978-0-8284-0314-6. ^ Grimsehl, Ernst (1932). A Textbook of Physics. Translated by Leonard Ary Woodward. London & Glasgow: Blackie & Son limited. p. 78. ^ Rescigno, Aldo (2003). Foundation of Pharmacokinetics. New York: Kluwer Academic/Plenum Publishers. p. 19. ISBN 978-0306477041. ^ Jennings, John (1721). Miscellanea in Usum Juventutis Academicae. Northampton: R. Aikes & G. Dicey. p. 67. Halliday, David; Resnick, Robert. Fundamentals of Physics. John Wiley & Sons. Chapter 9. Dugas, René (1988). A history of mechanics. Translated into English by J.R. Maddox (Dover ed.). New York: Dover Publications. ISBN 9780486656328. Feynman, Richard P.; Leighton, Robert B.; Sands, Matthew (2005). The Feynman lectures on physics, Volume 1: Mainly Mechanics, Radiation, and Heat (Definitive ed.). San Francisco: Pearson Addison-Wesley. ISBN 978-0805390469. Feynman, Richard P.; Leighton, Robert B.; Sands, Matthew (2006). The Feynman lectures on physics (Definitive ed.). San Francisco: Pearson Addison-Wesley. ISBN 978-0805390476. Feynman, Richard P.; Leighton, Robert B.; Sands, Matthew (2005). The Feynman lectures on physics, Volume III: Quantum Mechanics (Definitive ed.). New York: BasicBooks. ISBN 978-0805390490. Goldstein, Herbert (1980). Classical mechanics (2nd ed.). Reading, MA: Addison-Wesley Pub. Co. ISBN 978-0201029185. Hand, Louis N.; Finch, Janet D. Analytical Mechanics. Cambridge University Press. Chapter 4. Jackson, John David (1975). Classical electrodynamics (2nd ed.). New York: Wiley. ISBN 978-0471431329. Jammer, Max (1999). Concepts of force : a study in the foundations of dynamics (Facsim ed.). Mineola, New York: Dover Publications. ISBN 9780486406893. Landau, L.D. ; Lifshitz, E.M. (2000). The classical theory of fields. English edition, reprinted with corrections; translated from the Russian by Morton Hamermesh (4th ed.). Oxford: Butterworth Heinemann. ISBN 9780750627689. Rindler, Wolfgang (1986). Essential Relativity : Special, general and cosmological (2nd ed.). New York: Springer. ISBN 978-0387100906. Serway, Raymond; Jewett, John (2003). Physics for Scientists and Engineers (6th ed.). Brooks Cole. ISBN 978-0-534-40842-8. Stenger, Victor J. (2000). Timeless Reality: Symmetry, Simplicity, and Multiple Universes. Prometheus Books. pp. Chapter 12 in particular. Tipler, Paul (1998). Physics for Scientists and Engineers: Vol. 1: Mechanics, Oscillations and Waves, Thermodynamics (4th ed.). W.H. Freeman. ISBN 978-1-57259-492-0. Tritton, D.J. (2006). Physical fluid dynamics (2nd ed.). Oxford: Claredon Press. p. 58. ISBN 978-0198544937. Look up momentum in Wiktionary, the free dictionary.